Former Detroit Health Director Abdul El-Sayed is now running for governor as a Democrat. He claims he was fought at every step by his then-boss, Detroit Mayor Mike Duggan, in trying to guard the health of city children during home demolitions. “It's clear Abdul has completed his transition from man of science to politician because he's willing to say anything to get himself elected,” Duggan spokesman John Roach. 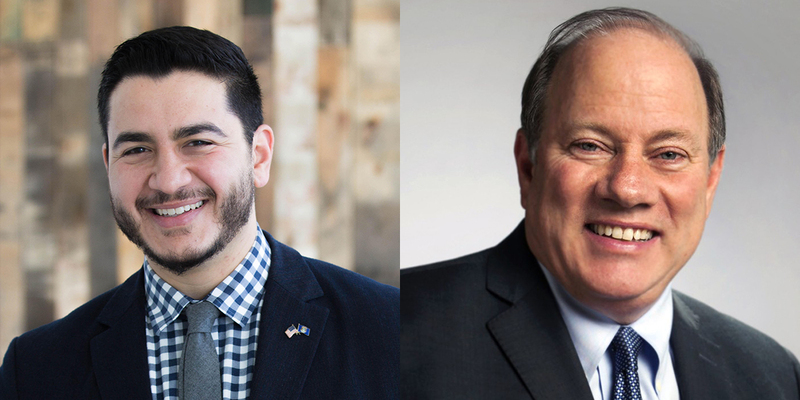 Duggan endorsed Whitmer last month after working with union leaders to recruit another candidate into the race. This week, the mayor’s office released a batch of emails El-Sayed wrote to demolitions officials while he was at the city that the mayor's aides claim refutes the doctor’s assertions. “It's clear Abdul has completed his transition from man of science to politician because he's willing to say anything to get himself elected,” Duggan spokesman John Roach told Bridge Magazine. Bridge reached out to El-Sayed again on Thursday after the emails were released to the media by Duggan. The campaign responded Friday by pointing to a Facebook post from El-Sayed saying the moratorium doesn't go far enough and calling Duggan "yet another Michigan politician willingly putting children in harm's way." "Nothing will do short of a city-wide moratorium on demolitions during the summer months until all task force recommendations have been adopted and the City can guarantee that it can demolish a home safely without exposing any of Detroit’s children to lead," the Facebook post read. Mayor Duggan sure doesn't respond well to criticism. Yikes. Did you read the article? The basis for criticism appears flimsy at best, and entirely politically driven. How would you respond if you were being criticized (I think "attacked" is more accurate) in this manner? El-Sayed's attempt to spin his highly-questionable eligibility into an issue of race and religion is strong evidence of his lack of integrity and fully supports the position that he'll say anything to get elected. AND what does this say about the candidate who happily accepts the endorsement of an accused child poisoner???? A serious reassessment needs to be made of Ms Gretchen or else we end up with a potential child murderer in her cabinet! Shouldn’t lead poisoning if Detroiters get as many headlines as the Flint situation? Where is the media? What happened to the residency issue of Dr. El-Sayed? Are people hoping this is forgotten? Do the powers that be just not want to push this because they might be accused of racism or something? Has the El-Sayed campaign committee already answered this and the media failed to report? Let’s be fair. Trump did something well before he even thought of running for office and while what he did was morally indefensible it was in no way illegal, yet the media is all over him all the time. Do not the authors or readers of Bridge care one little bit that something a candidate for Governor may be doing is not even legal? Arjay, it was Bridge that broke the story of the questions surrounding Dr. El-Sayed's eligibility. We are staying on top of it as new developments unfold. Right... And since the initial story, we have heard ...... crickets. Hi Arjay. We've followed it every step. It's in the courts. In their defense, it's not as if The Bridge was ever leading the charge to drum Dr. El-Sayed out of the race in the first place. They only reported the story on his ineligibility (which I strongly suspect after being tipped off either directly or indirectly from the democratic party establishment). The democratic party establishment knows that his "Santa Claus" platform doesn't work with most voters, which is why they want him off of the playing field toot sweet. Give the story time to play out. Abdul is constitutionally unqualified to be on the ballot...he just needs to respect the law and run in four years if he qualifies then. The state of Michigan pretty much said otherwise when their lawyers asked the courts to vacate Abdul's request for a preemptive ruling this week. They said it was premature and a fake issue perpetuated by the media and Democratic Party. Google it. Hi: That's not entirely accurate. The state of Michigan argued in court that, because no one has filed a petition to challenge Dr. El-Sayed's eligibility, it's a premature issue to go to the courts. The motion to withdraw didn't weigh in on the merits of whether he is eligible to be on the ballot. If mayor Duggan is so concerned about children's health why is he allowing 17,000 water shutoffs? Why are he and council unwilling to adopt a water a affordability plan now proposed several times? Why has there been such slow action on lead remediation in homes? Sadly children and low income families are not a priority and attacking Abdul does not change that! This Flint lead-in-the -water story seemed to me to have the authentic ring of humbug. The superstitious and ignorant copycats in the media, especially the portside ones, luxuriate on this kind of maudlin mush-they can write endless "me too" stories for months and expect gullible readers to wallow in the bathos. This whole lead business illustrates the relative failure of politics, the press and of democracy. An informed and courageous legislator or writer should have been able to "google" (I use Yahoo) this question. The above article from Scientific American pops up on the very first page, is lucid, authoritative and should have been deployed to abort this "brain damaged kids" story 2 years before the poor, simple paranoids in Detroit, Flint, politics and in the media poisoned their brains with yet more expensive, but not necessarily safer bottled water. In my humble opinion, El-Sayed's campaign is inflicting a lot of self-harm by attacking everyone in the Democratic primary. First, he accused Whitmer/establishment Dems of birtherism, then accused Cobbs of arresting young men in Detroit when Cobbs was a cop instead of protecting the city at a debate, then accused Shri of being a fake progessive, and now Duggan of poisoning kids? He is distancing himself from the majority of the Dem party by polarizing voters even more and using bad strategies such as a negative campaign so early on & using money too fast on an expensive staff without getting much statewide name ID recognition. Unfortunately for El-Sayed, all these moves indicate desperation... or just plain bad campaign management. I wish him the best and hope that the best Dem candidate to beat Schuette in the general election wins in this upcoming Dem primary. Thank you Joel for bringing us good reporting. Good luck in your future articles.